That's a different thread. The above-linked comment is from "Amiga & Phoenix Community > Software - Hyperion vs. Cloanto, et. al. Update" thread. Yes. I know it is a different thread, which is why I said "although this direct link functions"
The point being that "Hyperion vs. Cloanto, et. al. update" thread is visisible to non-members whilst Cloanto's purchase is not, because they moved it out of the same s/w sub-directory of your visible thread. Surely the recent news is applicable to the lawsuit, so I merely don't see how the recent topic became unworthy of viewing by non members. That was my only point. "This experimental port is based on Hyperion's Quake2 sourcecode"
The source code is available directly from Capehill's own site. That is neither Hyperion's binary nor its sourcecode. He still managed to get the "impossible to get" source code from Hyperion. Ask him to upload it to Aminet. What I was replying to and calling completely made-up nonsense is your claim that Hyperion would stand in the way of legal sites like now-defunct Amiga games website Back2roots appearing again, which had legal permission from the software companies to distribute Amiga games. This has nothing to do with rather modern, non-OCS/ECS/AGA games like Quake 2 or GPL. If you have purchased the binaries, you can request the source. >> & Phoenix Community > Software - Hyperion vs. Cloanto, et. al. Update" thread. > how the recent topic became unworthy of viewing by non members. Concatenating the two threads would surely lead to the new combined thread having to live in member-only area, so no, I prefer this not being done and better left as it is. "What I was replying to and calling completely made-up nonsense is your claim that Hyperion would stand in the way of legal sites like now-defunct Amiga games website Back2roots appearing again, which had legal permission from the software companies to distribute Amiga games." They would, of course - if they were in Cloanto's position and had any vested interests in said sites. Because they're an ego-driven, self-interested, cynical, money grabbing, unethical bunch of shitheads who care nothing about the community as long as they can get money. And everyone knows this from Hyperion's track record, your rather anaemic denialism notwithstanding. Nothing is safe, not even GPL. Not even work done for free, apparently. If they're happy to sell IP they didn't own to companies like Manomio which destroyed the chances of retro games coming back, they would be happy to stab the community in the back over sites like these, if they got their grubby little paws on it. Cloanto are much safer hands. >> permission from the software companies to distribute Amiga games. Cloanto or C-A Acquisition Corp. did not purchase Amiga Inc.
Cloanto hasn't been known as a hardware company so far. Come on... Don't split hairs. Someone paid a half million to get them current. Cloanto hasn't been known as a hardware company, but no reason that wouldn't change now that they are Amiga. Someone could approach Cloanto for a license to the Amiga brand. Could be an "Amiga 500 Mini" which seems to be all the rage these days, slapping a tiny arm board in a small pretty case running an emulator. Or someone could license the name and slap an "Amiga 6000" label on Tallos boards. >> Cloanto or C-A Acquisition Corp. did not purchase Amiga Inc.
> Someone paid a half million to get them current. ...and a company with the same owner as Cloanto purchased the remaining Amiga IP from them months later. >> Cloanto hasn't been known as a hardware company so far. > could approach Cloanto for a license to the Amiga brand. This would make Cloanto as much a hardware company as the "Amiga" license given to Philippe Lang, IContain or Commodore USA made Amiga Inc. Delaware a hardware company. The part that got me was "the fact that"
Honorable mention also to Writ Media Group (formerly Writer's Group Film Corp. at the time of transaction). Amiga Inc filled it with the stuff Writer's Group wanted to buy. Writer's Group examined the contents, paid for it, and took it home. >>>> Cloanto hasn't been known as a hardware company so far. >>> could approach Cloanto for a license to the Amiga brand. >> Commodore USA made Amiga Inc. Delaware a hardware company. Not quite a hardware company as far as I know. No need. Just read the forums from 1999 to 2019. Oh, and remember that they attempted to license the trademark 'Amiga Forever' just last year. Delusions are things that have no basis in fact or that disappear when looked at with available evidence. Hyperion being hyper-aggressive litigious shitwads who'll screw over anything or anyone they touch is not among those things. They just get worse the more you know about them. There's a good chance that Jens, A-Eon, Vampire etc etc want nothing to do with Cloanto now and won't license the IP, and retro will dissolve into "everyone blame Cloanto" infighting. Even then, it would still be better than having Hyperion swanning around with 3.x like they owned it. Look at the trouble they've caused already - nobody knows who owns what and companies who thought they were getting the real thing from the legal owners were driven out of business. > Just read the forums from 1999 to 2019. I've been following them quite closely most of the time. I won't dispute that. What I dispute is the likeliness of them touching legal sites like now-defunct Amiga games website Back2roots, which had legal permission from the software companies to distribute Amiga games. Of course nobody (also true for the individual developers) can get all IP rights from one hand. But having been persistently working towards making this possible during the last many, many years, is going to result in one of Cloanto's biggest achievements ever! OS4 has stalled in limbo, unpaid disgruntled "Boing Ball" developers have either paused, halted or they went home and took their ball with them. Major announced and promised developments never got finished, and key stuff like their flagship file system suddenly went MIA. OS3 "Checkmark" developers has let their work be published by Hyperion (even with an abomination "Boing Ball" logo), but at the same time they have been kind of careful about it, keeping their distance in a way, not even accepting financial rewards from sales for example. I think they have been monitoring the situation to see how things are being played out, not wanting to upset anyone more than necessary, keeping doors to alternative futures open. Hyperion seems to have reached the end of the line. Just like H&P once did. And Cloanto has a track record in circumventing stalled publishers (H&P) by approaching IP-owning individual developers directly, which "Workbench 3.X" (~OS3.9+ ATM IMHO) is an example of. Not saying it *will* happen with neither "3.1.4" nor "4.x", but it certainly is a possibility. It's a bit up to the developers as well, I suppose. Letting their efforts die off, or having it playing a part in an Amiga future? Maybe even the flagship file system might return to OS4 in an updated version, who knows? The post-commodore trend has been that the IP over the years has become more and more scattered, a development that is now (thanks to Cloanto) going in the opposite direction. "Commodore"? Well, who knows, but as I said in comment #565 I think the name "C-A Acquisition Corp" is food for imagination. A name that suggest a certain particular purpose; literally to acquire the C-A. The above image (~2 weeks old?) 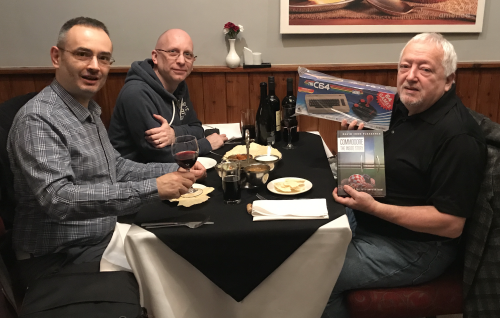 shows Paul Andrews from Retro Games, Mike Battilana from Cloanto, and David Pleasance, who was the Managing Director of CBM UK Ltd from 1993 - 1995, having been with Commodore UK since 1983. Without doubt, they are talking about new Commodore hardware (with or without the brand, nudge nudge "C-A Acquisition Corp"). Things can happen. And Cloanto has a track record of enabling stuff like this. The PPC enabled Amiga Forever, who in a single package could emulate everything from 1.0 68k to 4.1 PPC, quickly became the OS4 best-seller, before Hyperion killed it by violating yet some agreements and starting their trade mark wars. "The Walker" never became a product, thus "3.2" was ever merely a work in progress. "3.1.4" is in a way an extension of that work, and if those additions to 3.1 doesn't reward a .1 version bump in itself (historically, the evolution of the .1 steps has been even less), then maybe a selective merger of "3.1.4" and "Workbench 3.X" would? The important thing is to get away from the three-placeholder-version scheme that has always been an abomination. > file system might return to OS4 in an updated version, who knows? In comment #101 you of all people were calling this the "Boing Ball Branch" of 3.1, as opposed to the "Checkmark Branch". > Hyperion seems to have reached the end of the line. > Just like H&P once did. That's not comparable in my opinion. H&P tried to accomplish a move to x86 (Amithlon/AmigaXL). When they failed, they had enough of it. > that is now (thanks to Cloanto) going in the opposite direction. So far, Cloanto owns no more of the IP than Escom, Gateway or Amiga Inc. did. And they own less than Escom did. Let's see what will come off the purpose. A mere license to the mark would still be less than Escom owned. Even owning the mark would still be no more than Escom owned. > (with or without the brand, nudge nudge "C-A Acquisition Corp"). How could it be "Commodore hardware" without the Commodore brand? > "3.2" was ever merely a work in progress. Yet, Cloanto acknowledges its existence (see link in comment #41), so it seems unlikely they would use "3.2" for anything else. Next up and yet unused would be "3.3". As explained repeatedly, this "abomination" was introduced in 1989 by none other than Commodore itself (Workbench 1.3.x). >>> (with or without the brand, nudge nudge "C-A Acquisition Corp"). >> How could it be "Commodore hardware" without the Commodore brand? > the 2 entities in the process of securing their perceived rights. Licensing or purchasing the mark from either entity would result in the possibility to offer "Commodore hardware" *with* the Commodore brand. My question, however, is about how to offer "Commodore hardware" *without* the Commodore brand and what it is that makes hardware without the Commodore brand "Commodore hardware". When Amiga was sold before, it received main stream media coverage. I don't see anything resembling a press release from anyone this time. No, but this could be because apparently Hyperion don't like Amiga centric sites covering it - especially if they don't belong to Hyperion's alternative reality stream. Anyway, it's possible that Cloanto have done this under the radar to escape the attentions of the vast army of patent trolls out there who threaten to sue for the slightest reason. The French lottery bizarrely included. Anyway, it's possible that Cloanto have done this under the radar to escape the attentions of the vast army of patent trolls out there who threaten to sue for the slightest reason. I think it's more likely that they haven't issued any press releases because they a currently in a dispute with another party about rights to their IP and trademarks and don't want to forever be associated with said dispute. There is also the fact that while the dispute is ongoing they are pretty much boxed in, in terms of what they can do, by the 2009 settlement agreement which is still active. I don't think it would be good PR if you announce to the world that you are the new owner but you're currently in a legal dispute and are unable to announce your future vision for the brand and IP.